Courtesy photos Making a check presentation to the Tyrone Regional Health Network Foundation are representatives of the Tyrone Youth Football League. Shown are (from left): Rosemary Jorden Best, director, Tyrone Regional Health Network Foundation; Natalie Geisler, Tyrone Youth Football League secretary; Barb Seeger, Cougars team mom; Cheryl Endress, Eagles team mom; Noelle Hand, Eagles team mom, and her daughter, Hollynd Hand. Representatives of the Tyrone Lady Golden Eagles present their donation to Joseph J. Peluso, CEO Tyrone Regional Health Network/Tyrone Hospital. Shown are (from left): front row — Luke Rhoades (athletic director), Sarah Jackson, Kayla Michenfelder, Mia Kosoglow, Taylor Green and Kelsey Johnson; middle row — Chesney Saltsgiver, Shannon Shaw and Reilly Ronan; back row — Lindsay Fusco, Laura Kohler, Emily Lehman, Payton Wagner and Sydney Shaw. TYRONE — Two Tyrone Area School District sports teams have made donations to the Tyrone Regional Health Network Foundation with funds to be directed to Tyrone Hospital’s Breast Cancer & Women’s Health Institute’s Breast Cancer Voucher Program. The voucher program provides support to patients of BCWHI with breast cancer who are uninsured or underinsured to help ease financial pressures. The Lady Golden Eagles Basketball Program made a donation of $2,875.84, and the Tyrone Youth Football League donated $255. The youth football team raised funds via a Pink Out game held in October during Breast Cancer Awareness Month. During the game, the football players and game attendees wore pink apparel. Donations were collected at the concession stand and pink-dipped Oreos were sold. 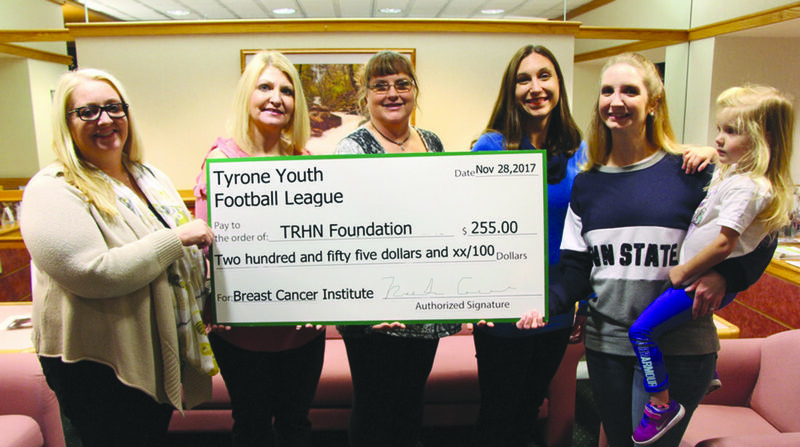 This the first year the Tyrone Youth Football league held the Breast Cancer Awareness event. Fundraising activities at the game included a T-shirt sale, a basket raffle with baskets donated by varsity, junior varsity and junior high girls basketball teams and a 50/50 drawing and a donation collection during halftime. The Lady Golden Eagles extend special thanks to the businesses and individuals who sponsored the event. They include: Albemarle Corp., Altoona Curve, American Eagle Paper Mills, American Legion of Tyrone, Beauty Counter, C&L Lawn Care, Central Pennsylvania Scholarship Fund, Connie Cook, Conner Heating and Air Conditioning, Dance Fusion, DelGrosso’s Amusement Park, Gio’s BBQ (Dave Panasiti), Kara Gwinn Family, Irvin’s on Main (Bellwood), The Kosoglow Family, Manning Photography, The Pastry Box (Bellwood), Penn State Men’s Basketball Team, Penn State Women’s Basketball Team, Pine Orthodontics, James and Roberta Ramsay, Reliance Bank, The Renovators of Tyrone Inc., Courtney Rhoades Family, the Richards family, Rodan and Fields (Marcie Lewis), the Ronan family, The Ronan Group, P.C. (State College), Sickler, Tarpey and Associates, Super Bakery, Surplus City, Tyrone Area Shopping Center Inc., Tyrone Elks, Tyrone Area Junior High School girls basketball team, Tyrone Area Senior High School varsity girls basketball team, Megan Wagner Family, Whitetail Lane Farm Homemade Goat Milk Soap and the Women’s Club of Tyrone.